Great news for Magento community! From now on, switching to the world's most feature-packed eCommerce solution is not even a challenge any more. Cart2Cart offers you a chance to perform an accurate migration to Magento 2 Enterprise Edition, fully automated shopping cart migration from 75+ eCommerce platforms, including Magento Community Edition 1.x - 2.x. Cart2Cart is not over with good news! From this time, we support a newly released Magento 2.1 version! Paypal enhancements. Now, PayPal has the additional in-context check-out feature that allows shoppers to pay with PayPal directly on the site that to great extent increases conversion rates of your site. Content Staging and Preview. From now on, you can create, edit, preview a large pile of content without IT assistance. Braintree Hosted Fields will increase your store's security by gathering and protecting all sensitive payment info in checkouts. Enhanced search using Elasticsearch instead of Solr empowers admins to define the most appropriate info for achieving the most relevant Google results. A pile of general fixed issues concerning the installation and upgrade, shopping, product, API, search, import/export were applied to improve your Magento store performance. Additionally, a great emphasis is paid to security enhancements to improve your Magento experience. So, how to perform a migration to Magento 2 Enterprise Edition? With Cart2Cart, of course! Put your worries aside and let Cart2Cart to take care of this task - the world’s most popular automated shopping cart migration service! Cart2Cart will meet your needs and wants, offering a simple 3 step transition procedure that minimizes time and needed resources to successfully migrate to Magento 2 EE. With NO technical expertise or developer’s involvement you'll receive the most comprehensive switch by simply providing your stores’ access info to ensure a proper data exchange. Cart2Cart will automatically move your products, categories, customers, orders, taxes, CMS pages, reviews and many other related entities to Magento 2 Enterprise Edition. The service supports migration from 75+ shopping carts and, of course, Magento 1.x - 2.x Community Edition. Furthermore, you can choose a wide range of additional options which will expand your Magento 2 EE migration opportunities. For example, you can easily move all your SEO URLs, customer passwords, automatically create 301 SEO redirects from all your current products and categories to products on Magento EE and many more. How to perform a migration to Magento 2 Enterprise Edition via Cart2Cart? Launch a full-scale Data Migration by pressing a single “Start Migration” button. Enjoy the results in up to few hours! If there are any specific requirements for your migration or a need in data customizations, Cart2Cart will help you out with that too! You can easily delegate the whole migration procedure to our professional team of Tech Engineers that will handle data transfer in accordance with all the expressed demands. 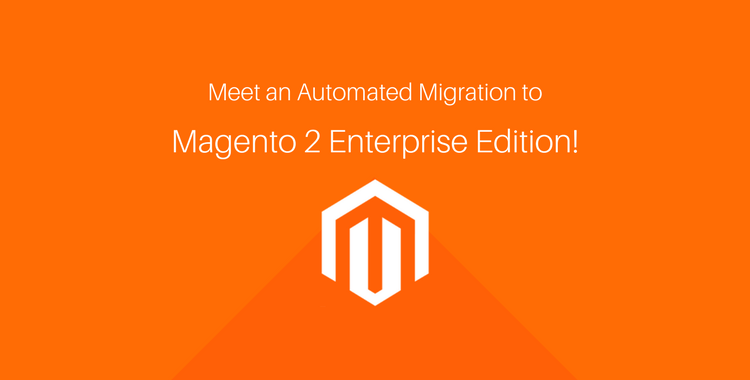 Start a Free Demo Migration to Magento 2 Enterprise Edition to see how Cart2Cart works in action!